During WWII, dogs were used by the military, as scouts, watch dogs, mascots, and to sniff out the hiding places of the enemy. There is no way to know how many human lives were saved by dogs, during WWII, but it is sure to number in the thousands. Along with there ability to perform guard duty, sniff out the enemy, and other tasks, they provided countless soldiers much needed companionship, unconditional love, and a much needed diversion from the harsh realities of war. On this page are images of dogs taken during WWII. 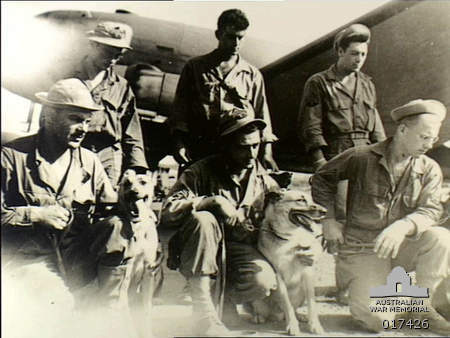 Dogs have long been used during wars, and are still used today, by the U.S. military. This dog and his handler are of the QM War Dog Platoon. Dogs were used on Biak Island, off the coast of New Guinea to find the caves and hideouts that the Japanese were hidden in. 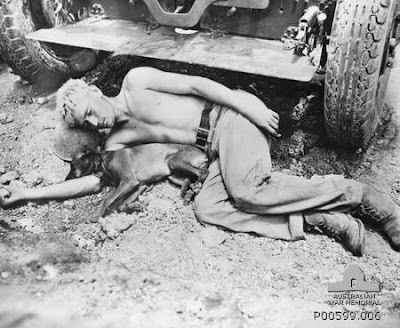 This soldier from the 7th War Dog Platoon, gets some rest while his dog Butch keeps watch. Iwo Jima, 1945. 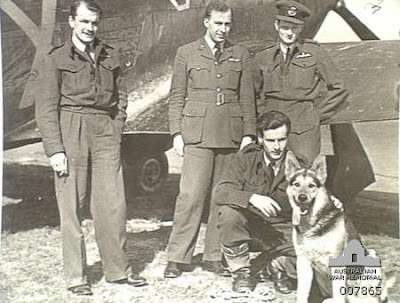 This crew of a night fighter squadron, is shown with their german shepard mascot. 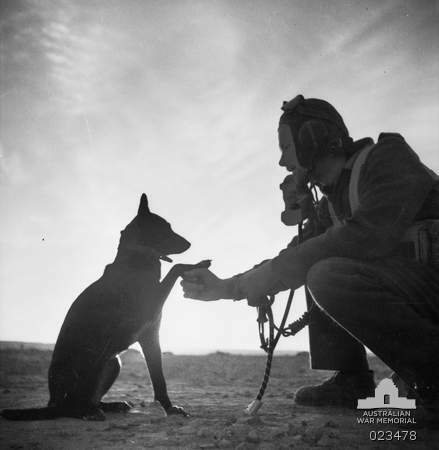 This scout dog named Sandy, was trained by the U.S. Dog Detachment for use by the Australian Army, October, 1943. This German War Dog was wounded by the 6th Air Born Division, at Rouville. 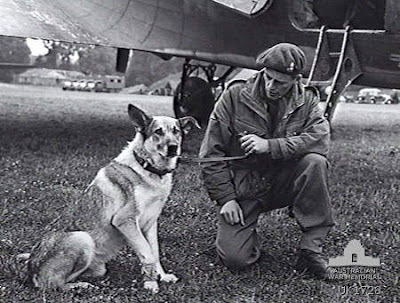 After being treated by the British army, he was flown to England to attend a British War Dogs school. This Marine and his buddy take advantage of a quiet moment, on Okinawa, beside a 105 MM Howitzer. 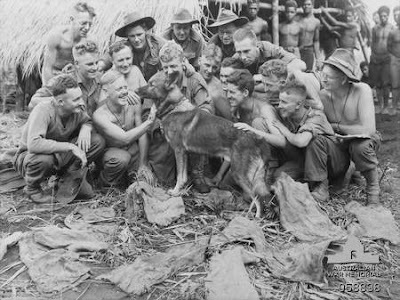 These dogs and their American handlers await to be transported to New Guinea. They are part of the Quartermaster War Dog Platoon. July 1944. This Australian soldier, with No. 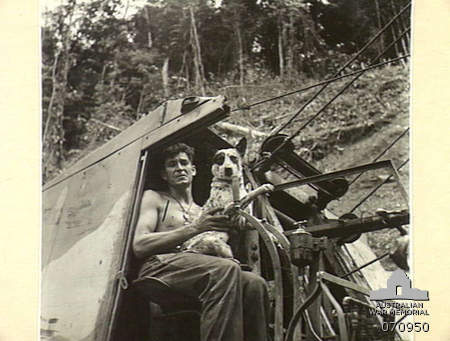 4 Platoon, 2/1st Mechanical Equipment Co., Royal Australian Engineers, is being assited by his dog "bluey". They are shown on a Quickway Shove., Feb. 1944. This dog attached itself to No. 3 Squadron, RAAF. Libya, 1942. A long line of Marine Raiders with their dogs, on Bougainville, November, 1943.